Hyperthermia Definition: The body temperature rises above the normal range. 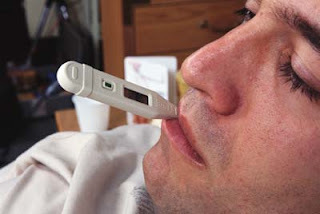 Normal body temperature is 36.5 to 37, 5o C.
Expenditures are not concentrated urine, electrolytes within normal limits. 1. Monitor the temperature every 2 hours. R /: Knowing the temperature of the body. R /: Effect of temperature increase is a change in pulse, respiration and blood pressure. 3. Monitor for signs of dehydration. R /: The body can lose water through the skin and evaporation. R /: Reduce body temperature. 5. Give the drink a pretty 2000 cc / day. 6. Perform a cold compress and warm. R /: Reduce body temperature through conduction. 7. Monitor signs of seizures. R /: hot body temperature risk for a seizure.